This is a human-readable view of the FGDC XML metadata. Abstract: These GIS files represent geographic boundaries for lands that are under the protection of NYS Agricultural District Law, administered by the New York State Department of Agriculture and Markets. The boundaries are derived from New York State Agricultural District, 1:24,000-scale, maps produced at county agencies. The district boundaries correspond to tax parcel data. District boundaries are joined into a file representing all of the Agricultural Districts within an entire county. Note that 2003 legislation allows lands to be added to districts on an annual basis. Electronic data provided here may predate those additions. Tax parcel detail and secondary rights-of-way are not included in this dataset. Rights-of-way for state and federal highways, railroads and utilities are only included when they are delineated on the original 1:24,000 scale maps. 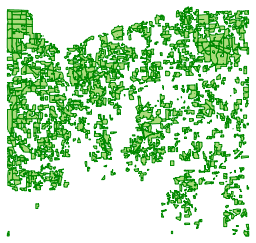 The data files are in ArcGIS shapefile format. Purpose: A Geographic Information System (ArcGIS) file intended to represent the lands within agricultural district. Please note that boundaries may be generalizations; precise information can be obtained from the county or town tax parcel information. Use_Constraints: 1) Refer to county tax parcel list of agricultural district properties and current 1:24,000-scale district maps in conjunction with annual open enrollment documentation on file for confirmation of precise boundaries. 2) Please acknowledge New York State Agricultural Districts Mapping Program as the source of the data. 3) It is important to check the certification date, found in the attribute table field called "Certified". The district data may have changed since the publication of this digital version. 4) These data are not to be resold in any form. Data_Set_Credit: Cornell IRIS maintains the county produced Agricultural District maps on file under contract with the New York State Department of Agriculture and Markets. In 1996 the maps on file at Cornell IRIS (then CLEARS) were scanned at the NYSDEC as the initial step in creating a digital database of Ag District Boundaries. Attribute_Accuracy_Report: The attributes were visually compared to original source map title blocks and confirmed against Agriculture Districts profile data provided by the Department of Agriculture and Markets. Logical_Consistency_Report: Boundary data reflect Agricultural District boundaries as displayed on 1:24,000-scale maps. When boundaries show areas contained mutually in more than one district in the same county, electronic data reflect this as an overlap. If individual tax parcels are dissolved to form an aggregate boundary, slivers and gaps may be formed by drafting discrepancies. These are visually compared to the map and eliminated when they do not represent intended exclusions. If the map is unclear, the county is contacted to confirm intent. District boundary shapefile data is printed out using DOT planimetric raster data as a base, then proofread against the maps. Completeness_Report: County Agricultural District boundaries are complete to the extent that the original map is complete. Tax parcel detail and secondary rights-of-way are not included in this dataset. Rights-of-way for state and federal highways, railroads and utilities are only included when they are delineated on the original 1:24,000 scale maps. NOTE: The most current and precise boundary of a district should be verified by referring to the tax parcel information. Horizontal_Positional_Accuracy_Report: Shapefiles are accurate to the quality of the original 1:24000 scale map. Type_of_Source_Media: Hard copy on Mylar, vellum or paper; digital on CD-ROM. Process_Description: 1) ORIGINAL SCAN PROJECT In 1996, the entire set of NYS Agricultural District maps in the collection of Cornell IRIS (originally CLEARS) was converted to digital format. This was done by shipping blueprint copies of the maps to the NYS DEC for scanning. Digital Line Graph files were returned, which were converted to ArcInfo Coverages. These coverages represented one map sheet apiece. Original maps with multiple sheets were represented by multiple coverages. Coverages were compared to the original maps and edited as necessary to create an accurate representation of the Ag District boundaries shown on the maps. When accuracy was confirmed, coverages representing multiple sheets were merged to create district coverages. Districts were then merged to create county coverages. Merged districts sometimes created slivers, which were eliminated, and gaps, which are flagged with district value of zero. Overlaps between districts also occurred in a few cases. These were flagged with district value "66". For each coverage, an attribute table was built to record the information shown on the Cornell IRIS title block of each Ag District hardcopy map. These tables are further described in the Entity and Attribute Information section of the metadata. Process_Description: 2) CONVERSION FROM COVERAGES TO SHAPEFILES: Internal polygons were labeled zero; coverages were reprojected from UTMz18 NAD27 to UTMz18 NAD83; Coverages were converted to shapefiles; zero polygons were deleted; attribute table was modified: deleted fields are AREA, PERIMETER, FILE#, FILE_ID, AGDIST#, DOTQUADS. Modified fields are DISTCODE and DISTRICT. DISTCODE is 12 characters to accommodate changing abbreviations -- currently four characters and three digits to represent a key code for county name and district number. The field DISTRICT was enlarged to accommodate district numbers up to five digits. Also, DISTCODE, the key field, was moved to the end of the attribute table columns. Process_Description: 3) UPDATING COUNTY BOUNDARY DATA: County shapefiles are updated to reflect modifications that occurred during the eight-year review process. Boundaries are revised using one or more of the three methods: Tablet digitizing; On-screen digitizing; Copying boundaries from county-supplied shapefiles. All modifications are proofread against the original maps to confirm accuracy. Attributes are updated and checked against the information on the map title blocks, as well as information on file. If individual tax parcels are dissolved to form an aggregate boundary, slivers and gaps may be formed by drafting discrepancies. These are visually compared to the map and eliminated when they do not represent intended exclusions. Discrepancies between the title block information and file information are clarified by contacting the county and/or New York State Department of Agriculture and Markets. Entity_Type_Definition: Agricultural districts are lands that are under the protection of NYS Agricultural District Law, administered by the New York State Department of Agriculture and Markets. Distribution_Liability: Cornell University provides these geographic data "as is". Cornell University makes no guarantee or warranty concerning the accuracy of information contained in the geographic data. Cornell University further makes no warranty either expressed or implied, regarding the condition of the product or its fitness for any particular purpose. The burden for determining fitness for use lies entirely with the user. Although these files have been processed successfully on computers at Cornell University, no warranty is made by Cornell University regarding the use of these data on any other system, nor does the fact of distribution constitute or imply any such warranty. Distribution_Liability: Cornell University provides these geographic data "as is." Cornell University makes no guarantee or warranty concerning the accuracy of information contained in the geographic data. Cornell University further makes no warranty either expressed or implied, regarding the condition of the product or its fitness for any particular purpose. The burden for determining fitness for use lies entirely with the user. Although these files have been processed successfully on computers at Cornell University, no warranty is made by Cornell University regarding the use of these data on any other system, nor does the fact of distribution constitute or imply any such warranty.